This year is on track to be the hottest on record globally. The strong El Niño is likely playing a role as the average global temperature of an El Niño year is 0.4°F higher than a La Niña year. However, the strong El Niño is not solely responsible for the warming planet. Global temperatures have been trending upward since 1950, regardless of whether or not the Pacific Ocean was in an El Niño, La Niña, or neutral phase. In fact, La Niña years in the 21st Century are now warmer than El Niño years just 30 years ago. Similarly, the long term trend of global ocean water temperatures is on the increase, emphasizing that El Niño is only magnifying the ongoing warming trend. The ongoing El Niño, among the strongest on record, will very likely play an important role in weather patterns across the country this winter. It increases the chances of a wetter winter in Southern California and a milder winter across the northern tier states. As the planet warms from the buildup of greenhouse gases, there may be a change in the atmospheric circulations near the equatorial Pacific Ocean. One possible result of that change is an increased number of extreme El Niños. In one projection, there is a greater warming of the water in the eastern equatorial Pacific compared to areas immediately north and south, or the West Pacific. The faster warming, in turn, could slow down the easterly trade winds that converge along the equator more often. These trade winds normally push warm water westward toward Asia. So, slower trade winds would allow the warm water in the western Pacific to slosh back to the central Pacific, which is a key element in the development of El Niño. With that pattern more frequently in place in warmer world, a higher number of extreme El Niño events could result. 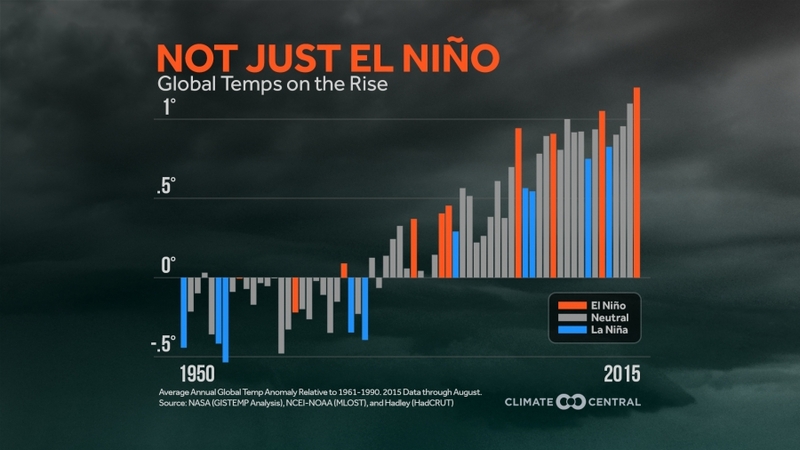 La Niña years are now hotter than El Niño years of 30 years ago. El Niños may be more extreme in a warming world. Definition of El Niño, La Nina, or Neutral conditions is based off of the WMO Statement on the Status of the Global Climate in 2014.